Humans have always been social creatures – from way back during the hunter-gatherer age to now all the way reaching our digital age. In fact, the book, ‘Ikigai’ tells us that one of the factors in becoming a centenarian (living over 100 years old) is having a social group to provide support to its members. Then it is no wonder that we apply the same psychology in our day to day lives, even when consuming a product. Have you ever looked through the reviews of a particular restaurant before visiting them? Or maybe consumed a particular protein bar because your favorite YouTube fitness vlogger said it was their favorite? If so, then you are not alone. We are all seeking testimonials, whether it’s from a friend, a colleague or in general, someone we trust. There is no lack of abundance in the range of products to choose from, in whatever market you may be searching for and we need to in some ways eliminate these choices to buy only one brand of product. But if we’ve never tried the brands before then how would we know which one to buy? Should we try all the brands? 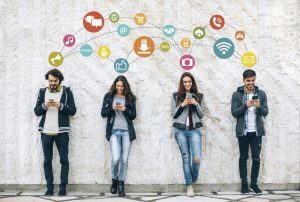 There must be a better way… This is where influencer marketing comes to play and why it is so effective that it has been said to be used by 92% of serious marketers. So now what exactly is Influencer Marketing? Influencer Marketing is a form of marketing which focuses on the relationships between an influencer and a brand. Influencers are people who have knowledge and audience in a particular niche market. They will buy, sample and act as a testimonial to the brand that customers are looking for and along with the trust they have built in their following, they are able to influence their followers. According to mediapost, 90% of people today skip pre roll ads and yet the usage of social media is more than ever increasing. This is why marketers have turned to influencers. For example Dunkin Donuts reached out to 8 lifestyle influencers on National Donut Day and as a result after 24 hours was that Dunkin’ Donuts gained ten times more followers to their Snapchat channel than they usually did in a month. The campaign reached 3 million people, with 40,000 cases of engagement. In addition, because influencer has control in how they want to portray the brand, it creates authenticity which consumers are attracted to. Last but not least, anyone can be an influencer! So there is no need to worry about a shortage of influencer whatever niche market you are in!